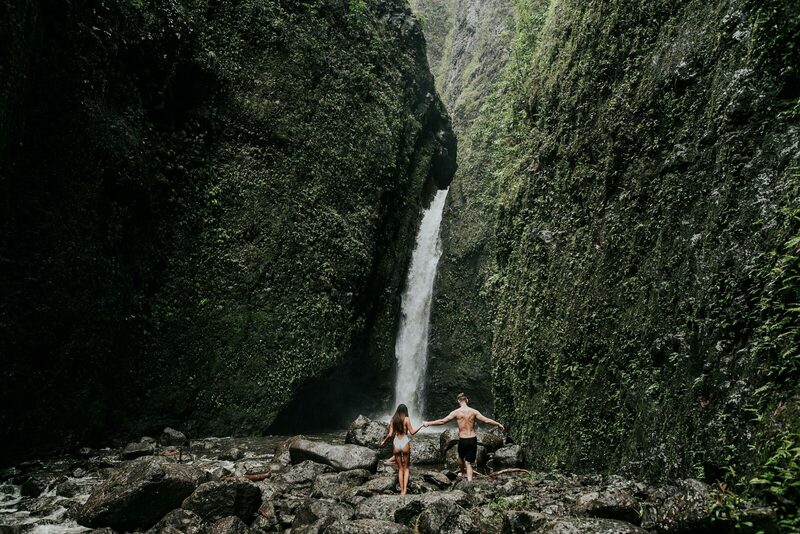 Lauren and Josh’s Oahu couples session was nothing short of amazing. The weather had been horrible and super rainy but we decided to make the trek up to the waterfall anyway. These two are a husband/wife duo who do videography and photography. Talk about power couple. Besides being super talented, they are two of the sweetest people I have ever met and SUPER in love too. I met them when I was photographing a wedding in Florida, they were the hired videographers. I instantly loved their kindness and could tell they were kindred free spirits. When I was planning my trip to Hawaii I knew I wanted to make a goal to shoot a couples session while I was there. Lauren and Josh were kind enough to jump in front of my camera as well as take me to this amazing waterfall. The hike was about an hour up through this amazing valley. I was just in awe of this place. I have experienced some beautiful places in this world but their is just something about Hawaii. You can feel the earth literally breathing there, it is something that is indescribable. These guys made my job super easy. They are so super in love that they needed no direction all. The pictures reflect their connection with each other as well with Hawaii. I’m looking forward to my next adventure hopfully soon to Hawaii to explore more of its beautiful offerings.